I have arrived in Saigon after over two hours flying from Hanoi with Pacific Airlines, a cheap airline joined with Qantas Airlines from Australia. The flight was delayed for 30 minutes but the journey was fine and I am now in Saigon for two weeks holiday for Christmas with my friends and my sister's family. I love going down here because the weather is not cold during Christmas time while Hanoi is freezing and it's sunny today, great, I love it. 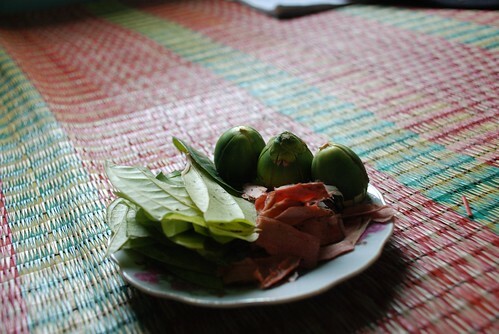 The food in the south is great with lots of herbs and vegetables and also people understand my countryside accent because I'm from here. I also love being with my sister who is going to cook me good food and hang out with me in the shops and on the tennis courts. I will try my best to update my blog as much as I can during the next two weeks. Hope everyone has a great holiday season. I have attended many of my friends' weddings in the countryside and I realized that, in the north, the wedding meals always start from 10am and some times, in some families, at 9am depending on where they live. It's quite funny because most people in the west would consider that to be breakfast time. 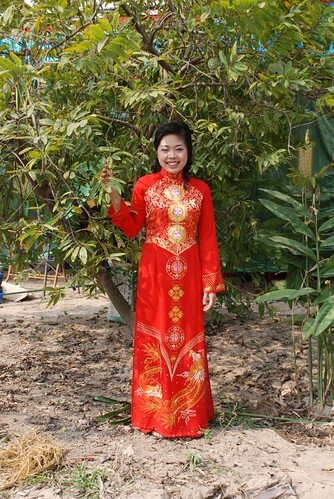 When attending these weddings, we have to leave Hanoi very early in the morning to be there on time. At these weddings, it's common to stay there for one hour, eat all the food, drink all the rice wine, get pissed then piss off. Sounds not pleasant but it really is pleasant and fun and I love it. The atmosphere of these weddings is really great, warm and special. The neighbors come and help the family out by cooking, decorating the home, talking to people and some of them sing and dance as well. It's so cool. Most of these couples are quite young, from 18 to 25 years old and they sometimes look a bit funny in wedding dresses. Also, it's quite normal for the brides to be a bit pregnant so the weddings have to be rushed so that they still look okay in their wedding dresses. The food at countryside weddings is always different to other weddings in the city because they use so much MSG, salt and sugar. In different areas, they serve their own special dishes such as cat, dog, rat and buffalo meat but they don't tell you at the beginning. They wait until the end of the party. 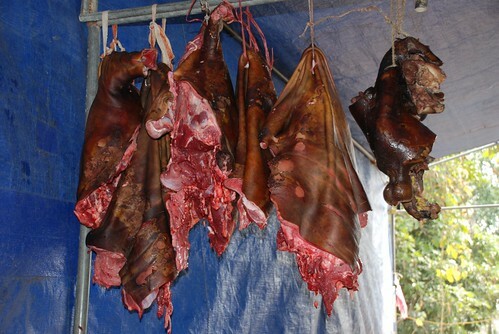 I have eaten these meats before and they are really tasty but I wouldn't try if I had known. A warning note is: if you have a weak stomach, do not go into the kitchen because you may be surprised at their cooking methods. Most of the food that they cook is near the floor and it's not like a normal kitchen. Some people take a pill before they go to countryside weddings as their stomachs are not so strong. If you have a chance to go this kind of wedding, go for it and enjoy the great atmosphere, try to be a local and try all the food and you can experience real northern Vietnamese culture. I always wake up a bit late on my holidays and it's no different today as I woke up at 11 Am. After a few minutes washing up, I started my day with a bowl of Saigon hu tieu. There's nothing better than that and a beautiful sunny day. I wandered around for a few hours before stopping at Sasa Cafe in Bui Vien Street for lunch.Walking the whole morning is hard work. The food isn't bad here with the high light being the spanish fried rice with chicken, seafood, sausage and vegetable, fresh spring rolls and cold beer. 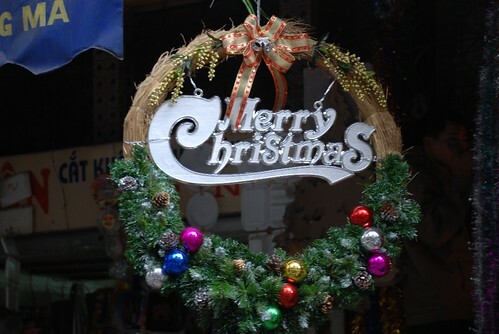 What I always notice in Saigon is the friendly service, which is one of the differences between the north and the south. In Hanoi, sometimes the service in restaurants can be not very welcoming. 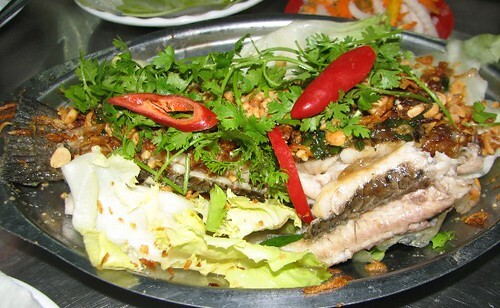 Later in the day, my sister and her friends invited me to Hoang Ty restaurant for dinner. 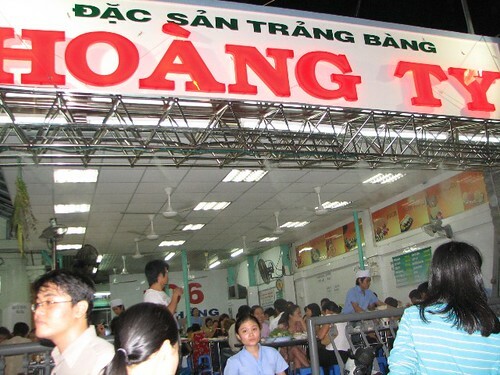 This is my favorite place in Saigon which serves great steamed fish and deep fried fish with lots of different vegetables and herbs, rolled in special Trang Bang rice paper. We ordered these dishes plus Cu Chi beef which was recommended because it was very tender like western beef. 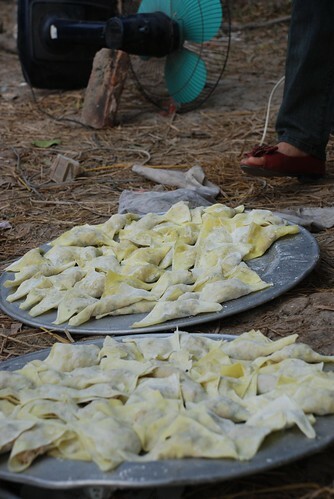 We also ordered boiled pork, crab and prawn noodle and pig feet noodles. It was enough food for a whole army and we couldn't actually finish it all. After dinner, we headed off to play tennis and we were all too full to play and not surprisingly, we couldn't move well to hit the ball! My good friends Eric, Mark and I were born under the same status of dragon year but in different years. As we are all going for our holiday next week, we decided to catch up with a group of good friends at Hoa Vien restaurant. 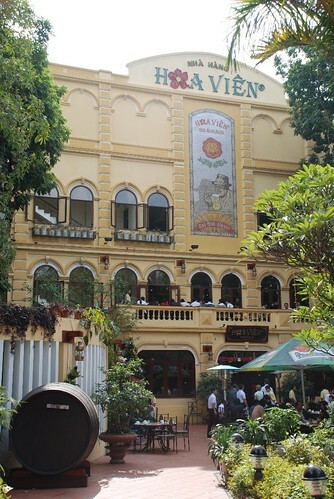 Hoa Vien is huge restaurant with outdoor seating and 3 storeys inside, located at 1 Tang Bac Ho street. The great thing inside is that you can pour your own fresh Czech beer at the table. 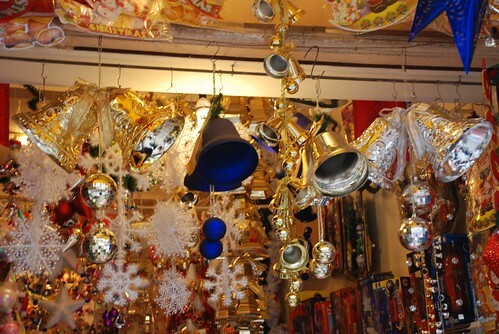 This is a fun thing to do and they also have a very good atmosphere with great staff. 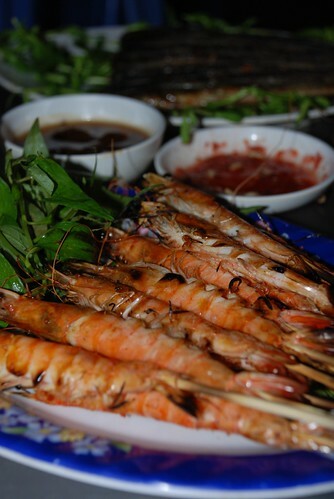 When everyone arrived, we ordered some really good prawn spring rolls, grilled prawns with bacon, Thai salad, susu vegetable, a seafood hotpot and some other dishes which I can't remember and of course the tall 4 litre glass cylinders of black beer, which are also tapped at the table. It was a great combination for talking and eating over a few hours. We had a fabulous evening with good friends and interesting conversations. Congratulations to my dearest friends Mark and Eric, also myself:) A great year is coming with many good things Also thanks to all of our friends for coming. 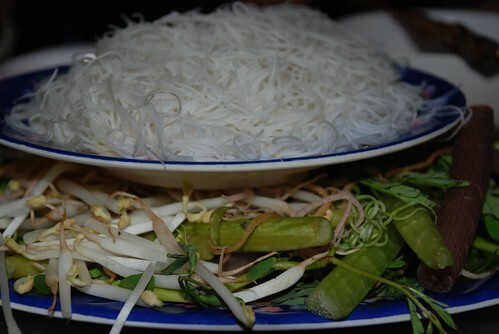 Hoa Vien is a great place for a special celebration with a big group of people. Yesterday, 15th December 2007 might be rcognised in the future as 'Rice Cooker Day'. 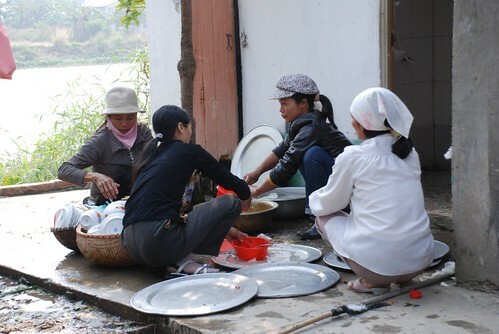 In Vietnam, we call helmets rice cookers and not many people like wearing them but from yesterday, they are compulsory. 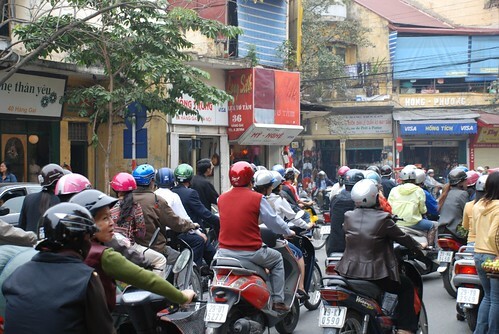 In other countries in the world, wearing a helmet is accepted as normal and necessary but, in Vietnam, people have never really liked the idea and the government have to issue a law to force everyone to wear a helmet. Today, I went out and was so surprised that most people were wearing them. 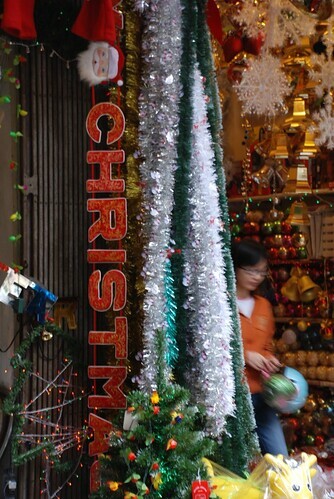 The variety of styles and colors actually make the Hanoi streets quite colorful. There are some men wearing pink, yellow or even purple helmets which made me laugh. I have a dark red one. I think it's become like a fashion item now. Anyway, good to see people wearing helmets. They are all over town, being sold in every single street from mats on the floor, from tables, too. 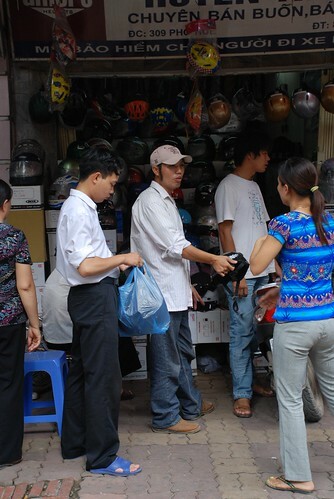 Most people who work as motorbike taxi drivers have bought helmets from China which are cheap because they have to buy at least two helmets and some people cannot afford to buy expensive ones. 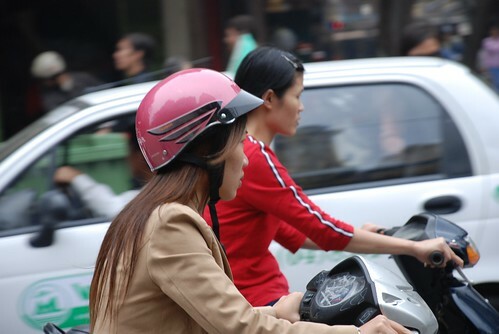 Wearing a helmet is important for road safety and we should have been wearing them for ages but Vietnamese have always thought helmets are a nuisance because you have to carry them everywhere. There are lots of people wearing helmets today without clipping the strap. They just put the helmet on to follow the rule because the government has recruited lots of police men to fine people driving without a helmet. Following the news on TV tonight, there was over 3,400 people fined yesterday. This is good and I agree that the goverment should give a big fine for whoever isn't wearing a helmet because people won't be serious about it otherwise. I was invited by one of my ex-colleague, Tuyet, to her wedding in Hung Yen, a small country town 60kms away from Hanoi. After almost an hour by car, we arrived at her house to a really warm welcome from her family who sent us straight to the table to try their food. Remember, it's 10Am. The food was all ready !!!!. I wanted to take a few minutes break to check out the local area to take some photos first. I talked to a few people about the area, the local food and the girl. When I took the camera out, many people came to ask me to take their photo and most of them were old people. It was really funny and sweet. I love that because I feel like I am at home and these people seem like my relatives.They are such sweet people, they helped Tuyet to organise her wedding the night before. They killed a pig, a small dear, ducks and chickens and they made some special cakes for the wedding. It was a real community effort. So much food, though, but thank god there was no cat meat, dog meat or buffalo meat this time. The food was really good even though there was so much MSG, which I could taste very clearly. 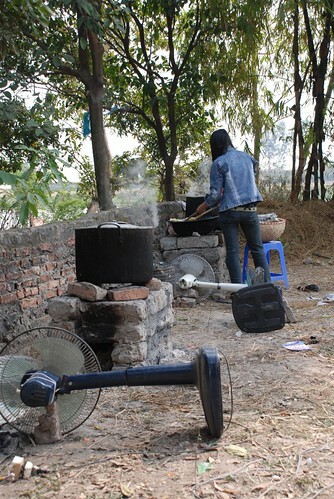 Even though it was quite early, the rice wine was always filled up after each toast and my friends were drunk after a few glasses because this homemade wine was much stronger than the stuff they normally drink in the city. We had a great time, everything seemed perfect. Thanks Tuyet for inviting us to your special and important day. Congratulations and I wish you all the best for your future happiness. I remember about 5 years ago when I had just arrived in Hanoi, my friends and I went to play tennis and the court keeper insisted that we pay in advance. We did that but in the middle of our court time, the court keeper told us that some other people needed the court now because they had also paid in advance the day before. I argued how unfair and unorganized this was but she told us to get off. 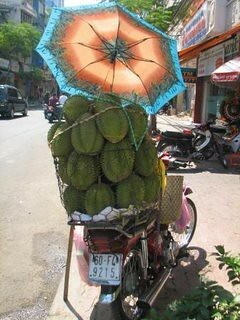 This is quite typical of how some business is done in Hanoi. Most tennis courts in Hanoi and some other businesses operate in the same way. That’s an experience I learned very early after coming to Hanoi to live five years ago. Booking a hotel in Hanoi also presents the same problems. If a guest is willing to pay a few more dollars for the room then they will give a previously booked room to them. I've had this happen to me many times while trying to book hotel rooms for friends from overseas. 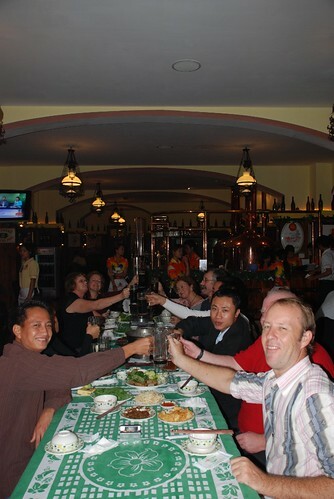 The last time was two weeks ago when two of my readers from the USA came to Hanoi for their vacation. I booked them in at the Prince Hotel in To Tich Street a month before they arrived and re-confirmed a few times in between then a final confirmation one day before they arrived. The hotel receptionist said everything was fine but the next morning they called me and told me that they didn't have any rooms for my friends. Even though the flooding in central Vietnam had caused travellers to change their plans to come to Hanoi earlier, I was still very angry that my booking was taken. In the past there has been no reason at all. In the process of trying to find rooms in other hotels, I also realised that the hotels in the old quarter had all raised their prices by 30%-50% to make more money from the sudden crowd of people. Finally, I found two rooms at the Trang An Hotel but I had to be sure that I really had them. I went to a tour agency and asked them to book me those rooms to be double sure. When the tour company picked up my friends from the airport (they arrived at midnight)and took them to the hotel, their rooms had been given away to other people! I called the hotel many times between 11.50 Pm to 1am to confirm that everything was okay and they kept repeating that my friends hadn't arrived yet. I couldn't believe it the next morning when my friend said that the taxi driver had driven around for an hour trying to find another room. The hotel staff called and found them a room in a guesthouse in the middle of nowhere and forced them pay to $40 in advance before giving my friends the address. Later they found that the guesthouse rooms were only $25! I couldn't stand to hear anymore and called to give the hotel staff a charge. This was after my friend had returned to the hotel the next morning and was told that the new charge on the room would be $55, $25 more than the price I had been told when I booked. They also cheated her by giving her fake money and old money that isn't used anymore and also put the price up for their airline tickets from 665,000Vnd to 880,000Vnd for Hanoi to Hue. The hotel owner had a really bad attitude as well and she didn't believe that her staff had behaved in such a way. What can I say? 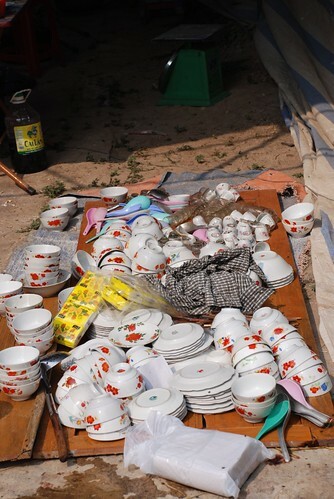 These people are ruining tourism in Vietnam and I hate this kind of cheating. They shouldn't be allowed to operate with such bad service and bad behavior? What I am going to do is name all of these hotels and warn people to avoid them! Be careful with any transactions with hotels in Hanoi! Don't get confused between Mua Rung restaurant and Mua Rung Discoque. 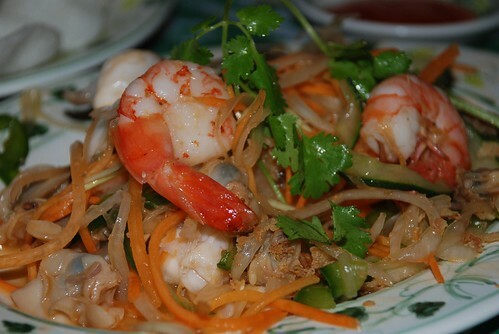 This is a real famous restaurant for southern Vietnamese dishes. 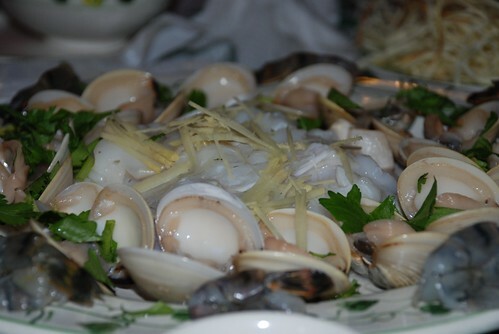 When the locals talk about Mua Rung, they always mention Ca Keo hot pot which is the most popular dish at this place. I love this hot pot, too. This restaurant is huge but it's busy all the time according to my sister. On the day of my visit earlier this year, it was packed. There is nothing special about the decoration and the set up but the friendly staff, great food and reasonable prices make it so popular. You can choose to sit on the first floor, second floor or on the third floor where they all have big fans spraying out a fine mist to cool the temperature down. 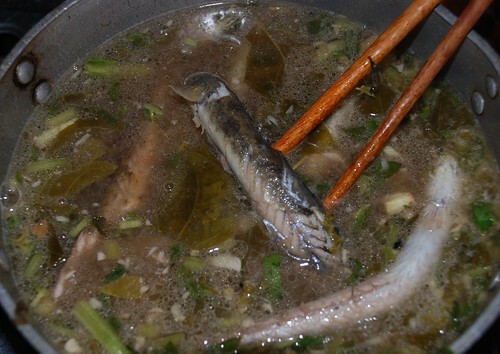 The ca keo hotpot contains Ca Keo fish, sour broth(canh chua) include dry onion, morning glory, Keo Neo vegetable, Dang vegetable, lots of herbs, bean shoots, lotus, celeri, water spinach, criander, banana, and other vegetables that I don't know how to translate(Bach Tang, Giang leaves, Keo Neo and a very special vegetable called Nhut which is only available in the south). 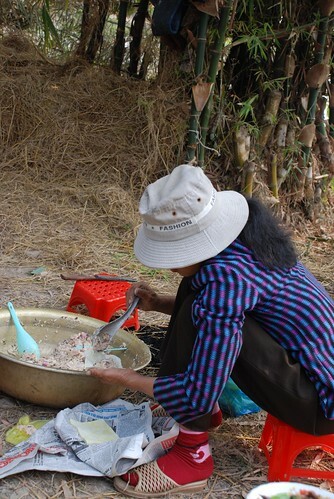 They use pork bones cooked for a long time to make a natural sweet stock then add some Thai sate stuff and their own special Mua Rung ingredients to make a really yummy sweet and sour stock. 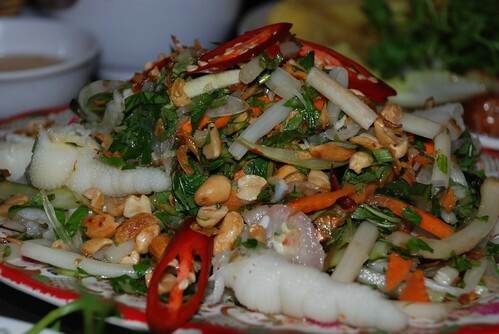 Beside the hotpot, they also serve a variety of Vietnamese food but for me, the highlights are the chicken feet salad, grilled Ca Keo fish, and grilled small river shrimps or sauted beef with onion and green pepper.